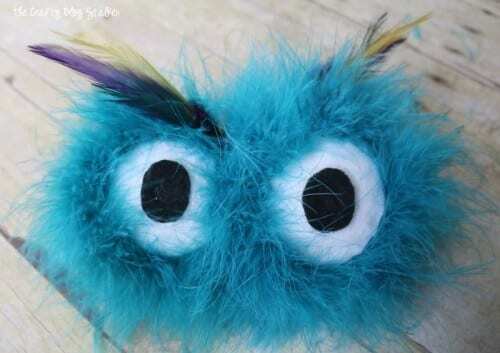 This Fluffy Monster Eyes Handbands is so cute and comes together really pretty quickly. Start with the black and white felt. Cut two 2 1/2-inch circles out of the white, and two 1-inch circles out of the black. With a hot glue gun glue the black circle on top the white circle. 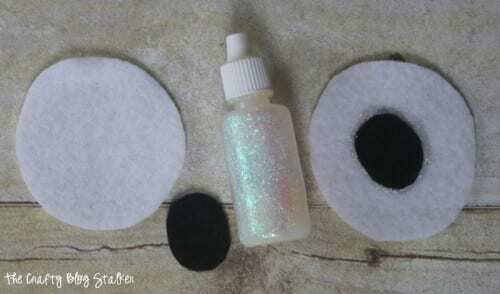 With the Glitter Fabric paint, outline the black pupils. Layer both eyes and let the fabric paint dry. 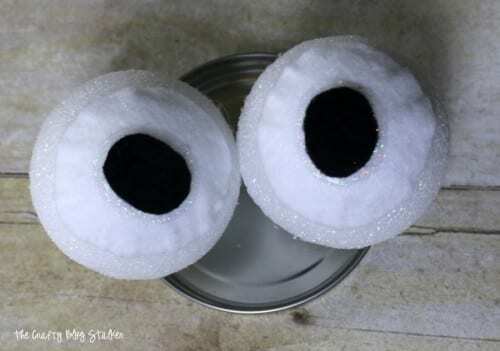 When dry, glue the felt eyes to the foam balls. I have never used floral pins before, but they are awesome!. They are like double pins with a bridge in the center that will hold down your material. 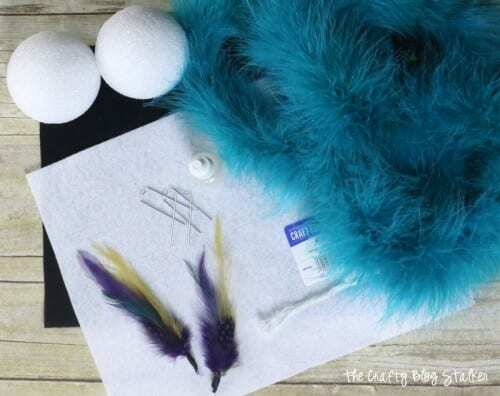 Begin wrapping the feather boa around the eye by securing one end of the boa to the foam ball with a floral pin. As you continue to wrap the boa around the eye, add more floral pins as needed to keep the boa secure and in place. When you can no longer see the foam ball trim off the rest of the boa with a pair of scissors. One eyeball is done. Repeat for the other eye. The feather picks are used for the eyebrows. Secure them in place with floral pins. To put the eyeballs together break a skewer stick so it is about 3 – 3 1/2 inches long. Insert the skewer between the eyes and secure by adding a dab of hot glue on both ends. AHHHHHH! So cute… but wait! For my headband, I used one that my girls already had. You could also use the elastic type of headband. Attach the eyes to the headband with floral pins. 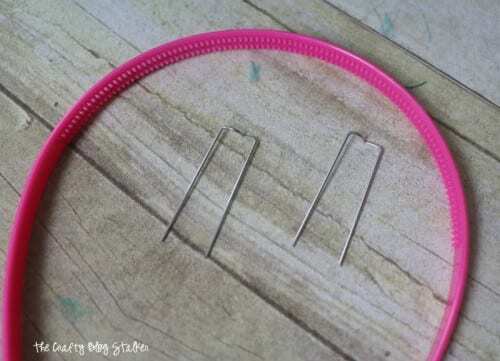 If you want to make sure it stays nice and securely add a dab of hot glue to each pin end of the floral pins. And that’s it! 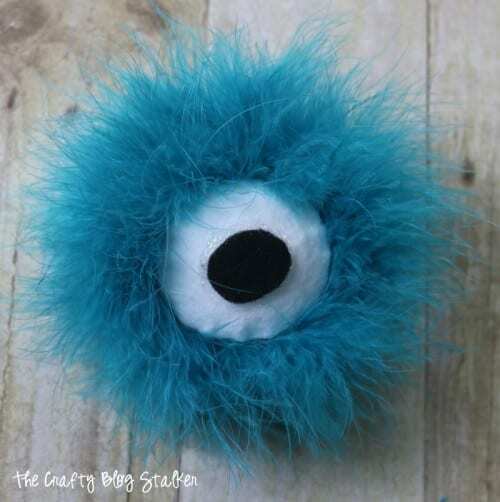 I think these Fluffy Monster Eyes are super cute, but you could also make them scary by using a black feather boa and red and black eyes. You could even make this a one-eyed or three-eyed monster! It’s your choice! This idea came from the Make it Fun Halloween eBook. There are a lot of really great ideas in here from Halloween decorations to a couple more takes on fun headbands! Download it for free! 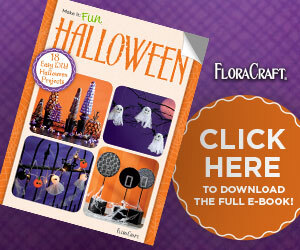 To learn more about FloraCraft Make It: Fun® Foam and get loads of project ideas, visit their website. What projects have you made using FloraCraft Make It: Fun® Foam? Share in the comments below. 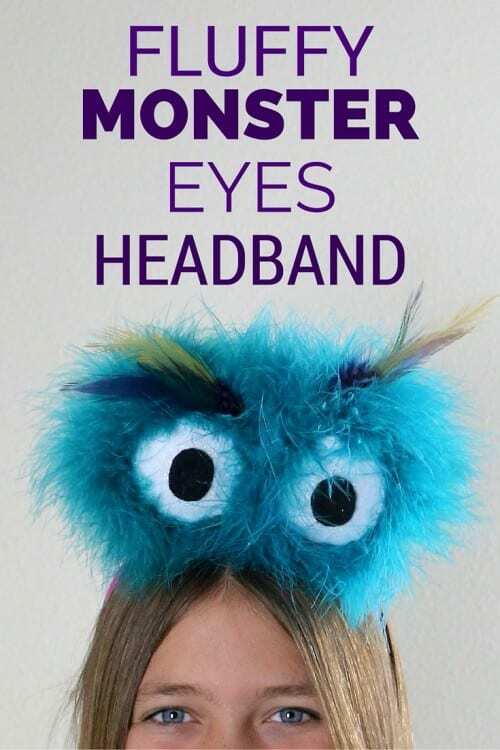 SAVE HOW TO MAKE A FLUFFY MONSTER EYES HEADBAND TO YOUR FAVORITE PINTEREST BOARD! What a fast, fun idea for a Halloween costume. Thank you! Thank you Sharon! I am so glad that you like it! This is just too adorable. It reminds me of one of those sesame street characters. Perfect for Halloween. Thanks for sharing the tutorial with us. I was thinking the fraggles as I was making it. LOL! This is so cute I love it! Especially if you don’t have a costume you can always whip up something adorable like this and pair it with street clothes but still look like you’re festive. The picture caught my eye it’s so adorable, I love the way you did the eyes. Pinning for inspiration for next Halloween – thanks for sharing at Welcome Home Wednesday. I totally agree, Linda! It is what I wore last year and I got a lot of compliments on it too!